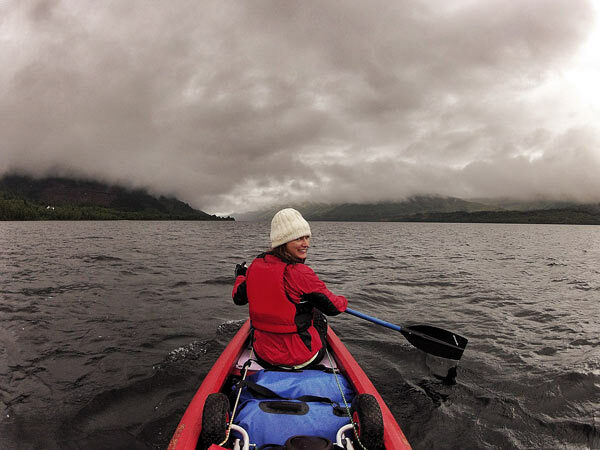 Canoe and camp your way across Scotland! Want to experience adventure, amazing scenery and undergo a physical challenge? 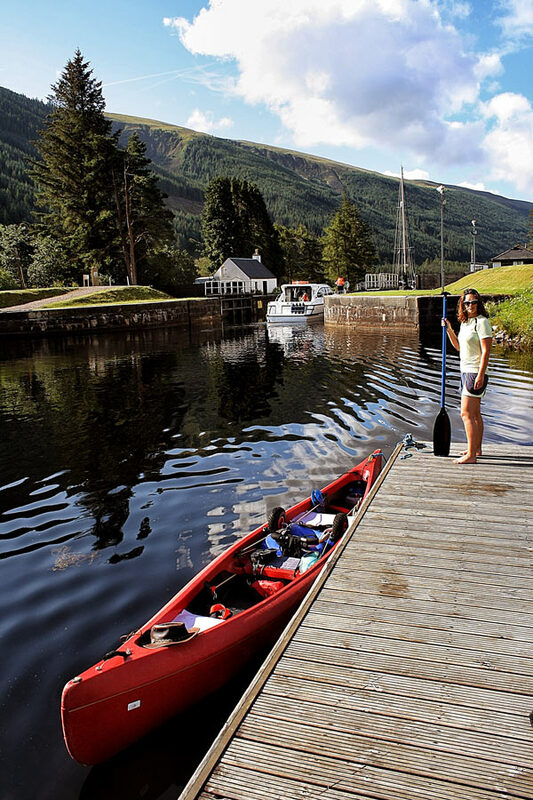 Then you should consider canoeing the Caledonian Canal through the Scottish Highlands. This is a trip that is achievable by anyone with a reasonable level of fitness; at 95km long, the Caledonian Canal will take around 5 days to paddle, if taking it fairly easily and taking the time to enjoy your surroundings, which are just breath-taking. To give you some background, the Caledonian Canal runs through the Great Glen Way; a geological fault enhanced by the ground-breaking (literally and metaphorically) of engineer Thomas Telford. The Great Glen Way consists of four lochs; Lochy, Oich, Ness and Dochfour. Telford designed a spectacular system of 22 miles of man-made canals and 28 locks to connect these lochs, providing safe passage for ships to travel from the west to the east coast of Scotland without having to brave the treacherous waters of Cape Wrath in the north of Scotland. The official Great Glen Canoe Trail, opened in 2007, was funded by the European Regional Development Fund, along with the Highland Council, the Scottish Canoe Association and the Highlands & Islands Partnership Programme. These four funding bodies worked with British Waterways Scotland, Scottish Natural Heritage and Forestry Commission Scotland to develop the trail's infrastructure, which means there is a great deal of support available for planning your adventure, and along your journey – for example, at each lock there are low level pontoons specifically for canoes. Visiting greatglencanoetrail.info is well worth while; not only do they have a very useful map, breaking down the trail, day by day, but they provide all the information you need with regards to the practicalities of getting your canoe to the start (or hiring if you don't have your own), your safety whilst paddling, and the facilities along the route. If you enjoy camping, you're in for a treat during this adventure. Wild camping is allowed in Scotland, although camping on the banks of the canal is not permitted. As such, there are frequent sites which allow wild camping around the locks, and if you rent a Trailblazer swipe card from either the Corpach Sea Lock Office in Fort William or the Canal Office at the Seaport Marina in Inverness for £10, then you'll have access to the composting toilets at the Trailblazer rest sites along the route, and the showers at several of the locks. If you've been paddling for several hours in the rain, then a warm shower is extremely welcome! The Trailblazer sites are located along the route, and provide a small area for wild camping, composting toilets and some have canoe racks too. Whilst camping is forbidden along the canal route, the world is your oyster as you travel along the lochs. A gem of an overnight stop is at at South Laggan Locks. If you follow the trail map as mentioned above, you'll arrive here at the end of day two. Along with a beautiful area for wild camping, the lock has warm showers, and houses the Eagle Barge, a permanently moored barge, converted into a pub. They welcome wet and muddy paddlers, and their syrup sponge is guaranteed to put a smile on the face of even the coldest and wettest paddler! Days three and four will see you take on Loch Ness. As you enter the loch at Fort Augustus, you get an idea of how big the loch truly is. You should consider whether to hug the north or south shore as to cross the loch in the middle can be dangerous to the winds that sweep up the loch. Following the south shore will provide you with solitude and a true feeling of wilderness, as well as spectacular wild camping opportunities. The north shore is more civilised, with a conveniently located bunk house at Altsigh, and the opportunity to see Urquhart Castle from the water. Coming to the end of Loch Ness is a bittersweet moment; the prevailing winds from south to north mean that the loch can be quite choppy which makes paddling hard going, particularly towards the end of the loch past Dores, but knowing the wilderness is behind you and the finish line ahead creates mixed feelings. There are companies who will arrange your travel for you between Banavie and Inverness for a reasonable cost. Alternatively, you can arrange with the Lockkeeper at Banavie to drop your canoe there, drive to Inverness, leave your car at the marina (free parking across the road), and then take the bus back towards Fort William. It takes a few hours but is the cheapest option and means less hassle at the end of the trip when you just want to go in search of the nearest square meal. Obviously, a canoe is essential! You can hire from a number of companies if you don't own your own craft. We used our 15ft Canadian Canoe for our trip, and this gave us plenty of room for all our kit. Pack all your kit in dry bags! It's Scotland. It's going to rain at some point and you will get wet getting in and out of your canoe. It's essential for your comfort and ability to smile at the end of the day to have dry clothes and a dry sleeping bag. Consider how you load your kit in your canoe; it took us a couple of days of wondering why the canoe kept veering to the right and eventually we realised we had a lot more weight on that side. A canoe trolley is essential. There are a number of portages (where you have to leave the canal and re-enter after the locks) along the route, including an absolute whooper at Fort Augustus. Your arms will be aching from paddling, you don't want to have to carry your canoe and all your kit as well. Also ensure you practise with your canoe trolley with a fully laden canoe before your trip. The canoe behaves in a very different manner when loaded up! Take a sleeping mat. You're not having to carry it so weight is less important than when hiking. Although several of the camping areas are very well maintained, some of the wild camping spots are a bit lumpy and you'll be glad of the additional comfort. Whilst there are bunkhouses along the route, the camping is so beautiful you should take every opportunity to sleep in your tent. A Tempest 200 will provide a compact packsize and a comfortable sleeping shelter. On this note, a tent is essential; I originally planned to only take a bivvy bag and tarp but depending on the time of year, midges are prevalent and you will be very glad of a refuge from the little bitey monsters. Since you're not having to carry your food on your back, you can afford to take a reasonable amount. Food is essential for maintaing energy and morale. Be warned, paddling will burn a lot of calories and you will need to refuel each day in order to enjoy yourself. Wayfayrer meals provide a hearty portion of real food ready to eat. They can also be heated and eaten direct from the bag, saving on the washing up! There are shops along the route at Well of the Seven Heads, Fort Augustus and Foyers where you can stock up. Although there are a couple of bunkhouses along the route, you will have to camp at least a couple of nights. 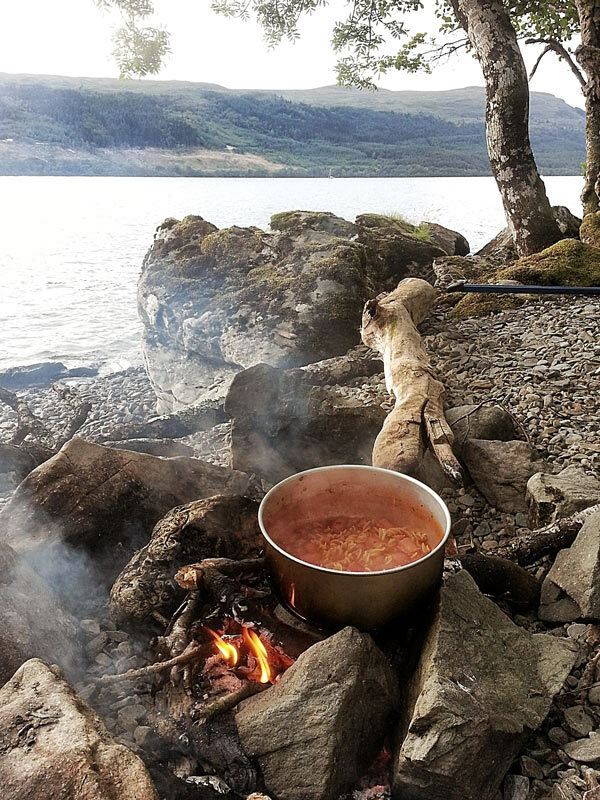 Make sure you take your camp stove, hot food is so very welcome at the end of a long day paddling! This should go without saying but really is an important point: wear a bouyancy aid. You may not plan to fall in the water but even in the middle of summer, Loch Ness is cold enough that you may go into shock and be unable to swim. Keep a close eye on the weather forecast, particularly the wind speed and direction. On the open stretches of water you'll really notice if the wind is against you. Paddle on the right hand side when on the canal. There are a number of other craft on the water and you'll need to be aware of etiquette and safety rules when in the presence of larger boats. Respect the distance and the stamina required. Though this is not a technically difficult paddle, you should have reasonable experience of canoeing. Consider a couple of lessons before taking on this challenge. Lastly, enjoy yourself! It's hard work but this is such a wonderful adventure and a fantastic way to experience the stunning scenery of the Scottish Highlands.